We are Mustang enthusiasts just like you! We “grew up” with the Mustang Hobby and started selling parts for 1964 ½-73 model Mustangs over 35 years ago. Our first catalog published in 1978 was just a small flyer. In 1984, we printed our first color cover catalog with a whopping 64 pages! Our last printed catalog was the 2012 edition and featured 223 pages and over 1000 photos. We currently do not print a paper catalog. In the past few years, we have added and continued to improve our online catalog and web site that you see here. The web site allows us to make "real time" updates to bring you the most current parts and information. We take pride in offering excellent service, quality parts, a huge inventory and reasonable prices. 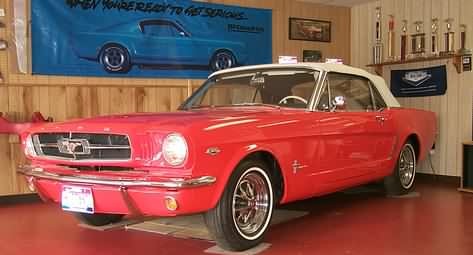 We will be happy to help you with your 1964 ½-73 Mustang Parts needs. If there is something that you don't see here or can't find, please give one of the members of our friendly staff a call at 540-896-2695...better yet, come visit us! Directions to our Showroom Take exit 257 off I-81. Take Route 259 West (towards Broadway) approximately 4 ½ miles. Turn left at second stop light (still on Route 259 West/W. Lee St.) Travel less than one mile on Route 259 West (W. Lee St.) We are on the right across from J. Frank Hillyard Middle School.